Big Finish: TORCHWOOD: FALL TO EARTH | Warped Factor - Words in the Key of Geek. Tony Fyler falls for a returning hero. There’s a sense in the first series of Torchwood audios from Big Finish that what you’re getting is solid, unpretentious, unpadded Torchwood, simply done on audio. The first episode, reviewed by my pal Matthew, we discover there’s a proper, David Icke-style conspiracy to rule and then destroy the world, run by a bunch known simply as The Committee. Jack abruptly buggers off to be all macho and heroic in a fantastic coat, leaving the little people to cope as best they can. Ianto Jones is the very epitome of the little people. As it turns out, he copes by stowing away on board the first commercial spaceflight (“Ianto Jones – Space Butler” – spin-off from the spin-off, anyone? ), intending to try and keep everyone safe on this important event, in case there’s any Committee interest in nobbling such a landmark event. The structure of this audio play is a pure joy by James Goss. On a spaceship, with everyone falling to earth, and those who aren’t already dead either turning into some kind of zombie or about to hit the ground with quite a large bang, Ianto’s got a pretty, spouting leg wound when, of all things, his mobile connects – to an insurance selling call centre. Yes, this is how to save the world, while on a sales call. You get extra brownie points when you think up something as deliciously silly as that, and still make it credible, and threatening, and sad, and bitter, and ultimately wonderful. So – extra brownie points for Mr Goss, then. As is said in the extras of this audio, for much of Torchwood, Ianto got to stand in the background. He was the one with the pithy line in response to the sound of dropping underwear and lolling tongues whenever Captain Jack coat-flapped his way into a room. Here we get to go a bit deeper than that, because Ianto’s not on an official assignment but a hunch, in much the same way as he was when he did most of his best work in the TV Torchwood. And the story also gives us an object lesson in exactly why Ianto evolved from getting the pizza and manning reception to being the logistics guru – essentially the ‘Q’ of Torchwood 3. He’s much more than a pretty face, and he goes from heading uncontrolled into space with a zombie zillionaire and a dead boy band to winning the trust of a Turkish call centre cold caller, with whom he works in unison to avoid bombing the bejesus out of a town of ‘little people’ in Turkey as The Committee have covertly planned to do. Granted, along the way he has to buy A LOT of insurance, so let that be a lesson to you – always take a valid credit card with you on a covert mission – you never know when you’ll be called on to save some people, or indeed what it might take to do so. Fall To Earth is a pretty tight (for the most part) two-hander, heralding the return of the singularly not-dead Gareth David-Lloyd as Ianto, and Lisa Zahra as Zainab, the (as it turns out, quite unlucky) cold caller who on this particular day makes contact with one of Torchwood’s finest. Both actors invest their characters with realism and humour without overplaying their hand, allowing the humour of the premise to ride with them, but never playing ostensibly for laughs – which means when things take a turn for the serious, as they inevitably do (you caught the bit about the spaceship crashing to earth and killing a town full of innocent people, right? ), it doesn’t feel like too much of a tonal shift, for all that Ianto’s had to find new uses for both his necktie and a zillionaire’s luggage along the way, not to mention buying pet insurance for a pterodactyl and conservatory insurance on a conservatory he doesn’t have. Perhaps best of all, while the plot of the previous release is advanced by this story, it’s done in what feels like a very gentle way, allowing the human drama of two people on a phone as some really quite extraordinary things are happening to be front and centre. Brownie points then to Scott Handcock on directing duties for keeping it tight, but not ‘audio drama’ tight, just ‘real life tight – yes, the hits keep coming, and in some ways it reminds us of The Martian: now there’s this problem to solve; now there’s this problem to solve, all to avoid dying and, in this case, killing a bunch of innocent people into the bargain. But it never particularly feels like a story that’s been scripted to be this endless series of dilemmas, more like just a really bad day at a couple of offices. While the overall feel of these audios is very faithful to the Torchwood spirit, separating it somewhat from much else in the Big Finish repertoire, this story finds a very amiable meeting point between the grit of Torchwood and the humour at which Big Finish excels, making for a very quick hour, but one that will more than raise your pulse and give you goose bumps by the end of the ride. The emotional journey is well leavened, but never make the mistake of thinking Fall To Earth won’t put you through the wringer, because it will – in particular, and of special relevance in this day and age, the haphazardness with which the lives of the innocent are thrown away by those who believe in a manifest destiny comes muscling through the comedy, and the impossibility of life or death decisions when you’ve put someone else in the frame that was meant for you will make you gulp. The delicious truth is that Ianto, in the mission he originally sets himself getting on the spaceship, fails. Everyone he was trying to save dies, and he may even have had more to do with that than he’d ever like to think. The odd thing is that we know Ianto doesn’t die here – we’ve seen him die in Torchwood: Children of Earth – but the tension and the increasingly impossible odds allow us to temporarily suspend our prior knowledge, and worry for him. We worry even more for Zainab, whose part in the events of Fall To Earth, Phonebooth-style, seems to have a ghastly randomness about it, and who may not survive her first – and only? – encounter with the work of Torchwood. 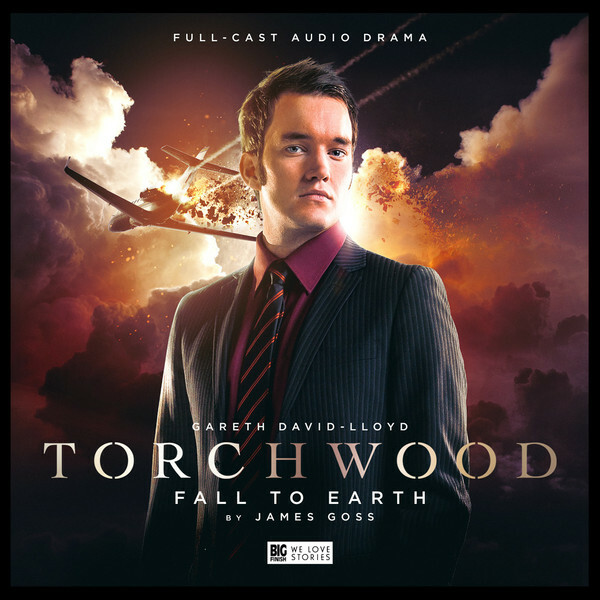 Fall To Earth is a skilfully plotted, easily-played, tense hour of Torchwood as it is at Big Finish. It allows us to renew and old friendship, and make a whole new one, all in what has a distinct feeling of real time. It’s one to re-listen to, for the emotional arc, the strong and agreeable characterisation and not least the fun factor and the dialogue. Welcome back, Ianto Jones – the Space Butler’s been gone too long.